In late June 1904, a Dutch farmer named Hilbrand Gringhuis was out cutting peat on the Netherlands side of Bourtangermoor when he uncovered something very unsettling: a withered, nearly headless body resting, it seemed, upon the arm of a second corpse. Gringhuis immediately notified the local police, who came out to investigate. And, in a time long before modern forensic science, the local constabulary decided to transfer the soggy cadavers to the nearest morgue in a very peculiar fashion. 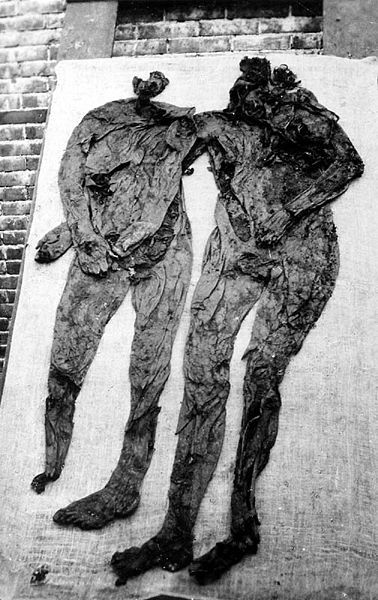 The Weerdinge men, shown drying out on a piece of cloth in today’s photo, were of course bog bodies. Radiocarbon-dated to some 1980 years ago, they are two of the nearly 1900 such bodies either reported or recovered from bogs stretching from Ireland to Norway. Like many of these bodies, one of the Weerdinge men was the victim of extreme violence. Modern forensic study shows that someone almost certainly stabbed him to death: the victim’s withered brown intestines now tumble from the wound. But the violence that these two bodies suffered after death disturbs me almost as much as the m.o. of their demise. And I’m sorry to say that this unthinking destruction is part of a much larger pattern. All across Europe, companies are excavating, mining and draining bogs. Land developers, for example, are keen to reclaim wetlands for new housing developments. And gardeners love to spread peat on their flower beds. All those big plastic bags of peat you see in European plant nurseries come from once great bogs and wetlands. Eerily preserved by the peculiar chemistry of bog water, the bog bodies can tell us enormous amounts about subjects as diverse as ancient clothing, diet, and sacrificial practices. But ironically, as our interest in these curious-looking mummies grows and our ability to draw knowledge from their witheed flesh increases, we are less and less likely to find them. The large excavators that companies use to mine peat from bogs tend to chew up bodies before their drivers even realize what is happening. And there is one other sad note to all this. Swedish archaeologist Martin Rundqvist has posted a very thoughtful entry on his blog this morning about the Swedish Bog Cultivation Society, which destroyed precious bogland in Sweden for what Rundqvist calls “no practical gain.” In other words, the money-making schemes behind all this environmental destruction never panned out. And who knows how many bog bodies were obliterated in the process? Photo courtesy of the Drents Museum, Assen. Thank you! It is indeed sad to think of what we’ve lost and what we’re losing. In Swedish museum inventories, there is a distinct drop-off point in the inter-war years when many types of bronze and stone tool were suddenly handed in much less frequently than before. This point marks the moment when the farmers got tractors. No longer did they walk behind the plough where they could see what was surfacing. Hi I’ve just posted about Grauballe man. The bog bodies are a fascinating part of our past and we can learn so much from them. It is scandalous that so many of them are being destroyed – and for what? A lot of them are being chopped up by peat cutting machinery. It’s so sad.